A tempestite, like the one pictured, is a rock composed of debris deposited by a storm. It’s mostly a sandstone but also contains various fossils, pebbles, and other clasts that were picked up and tossed about by the waves. Waves are generated as wind energy is transferred to water. Naturally, during a storm, waves are bigger and more energetic. This increased energy allows the waves to pick up, and in some cases rip up, various relatively large clasts and fossils and transport them. The large elongate fossil above is an extinct squid-like creature known as a conical nautiloid. 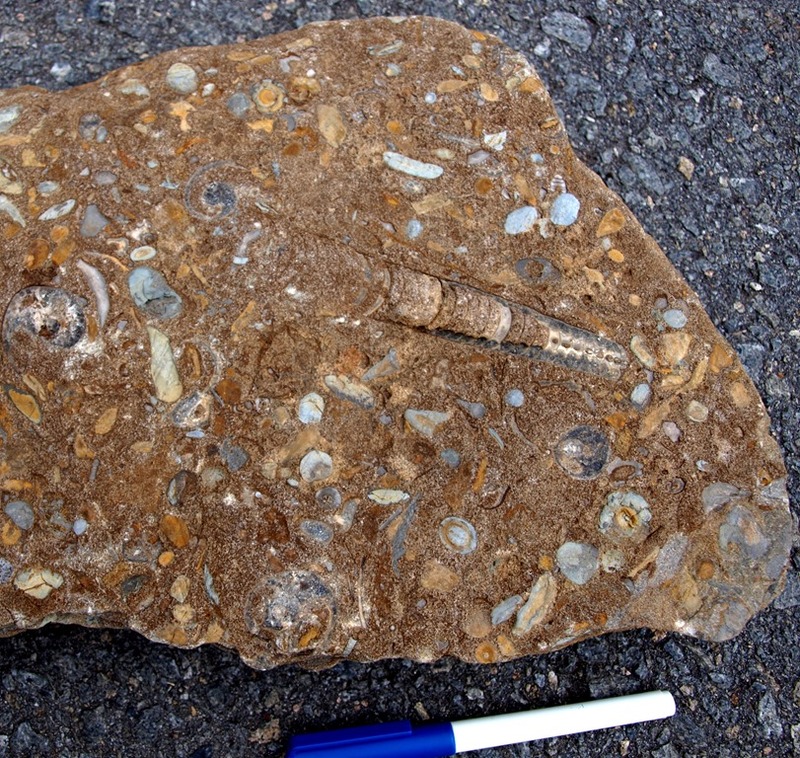 Other marine fossils in this sample include gastropods, and crinoids. It also contains plant material. The presence of tempestites in a rock outcrop indicate the area was a shallow marine environment when those rocks were being deposited. This sample was collected in Northwest Arkansas from the Pennsylvanian Prairie Grove Member of the Hale Formation. This entry was posted in #geoblog, GeoPic of the Week, Sedimentary Features and tagged fossils, Geology, orthoconic nautaloid, Tempestite on November 8, 2017 by argeology.